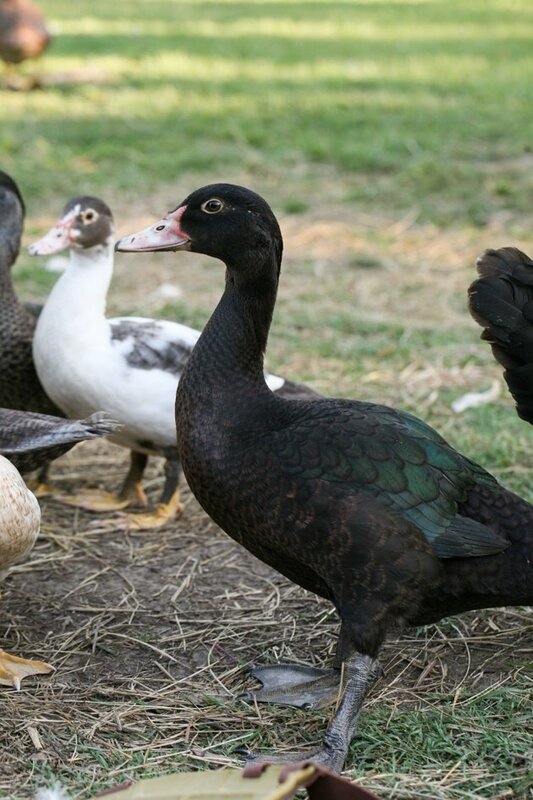 In this post, we are going to talk about raising Muscovy Ducks! I’ve been raising Muscovy ducks for a few years now and I am totally in love with them. Let’s talk about Muscovy duck care, how to raise Muscovy ducks for egg production, raising Muscovy ducks for meat, what to feed Muscovy ducks and so on… If you have any experience with these wonderful creatures and you want to share or add anything, please comment below. I’ve been raising Muscovy ducks for a few years now and I can tell you, hands down, it’s the easiest animal I have ever taken care of. Or in other words… they pretty much take care of themselves. 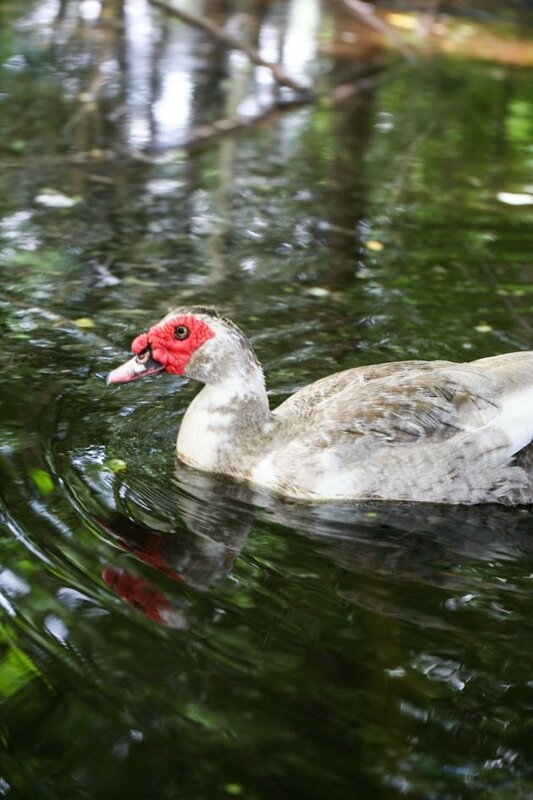 Muscovy ducks are native to South America and you can still find them roaming around wild in the jungles there. Their original name was Musco ducks because they eat so many mosquitos. The Russian Muscovites were the first to import them into their country and raise them; this is where the name Muscovy came from. They are the only duck that is not derived from the mallard duck. In fact, they are not considered a duck. They are a large waterfowl, something between a goose and a duck. Muscovy males are large. They can reach 15 lb while the females are smaller and can reach about 9 lb. The male can fly but not very well. I see my male ducks fly very low, just a few feet off the ground and not very often. The females are great flyers. They fly all over and around the homestead and often land on the roof of the house and just hang there for a while, walking from here to there. 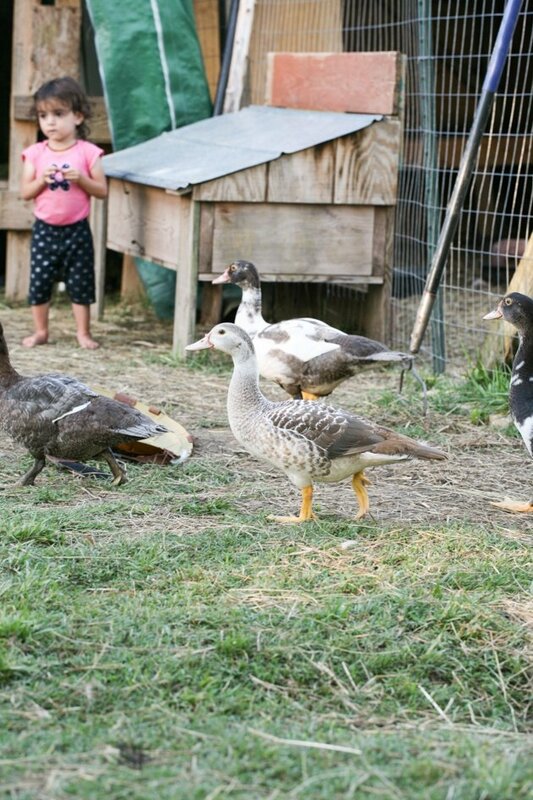 If you don’t want to have your ducks free-range and prefer for them to be fenced and not fly around, you can clip one of their wings just as you would do with chickens. I show how to do this in my post: How to Clip Chicken Wings. Muscovies have many different and beautiful colors. When they reach maturity, they grow those large red, warty caruncles on their head. This is how you know that they’ve reached egg laying/mating age (usually between six to nine month). In this post, you’ll see a lot of pictures of my Muscovy ducks without the red, warty caruncles, this is because they are still young, probably around 4 months of age. They eat a whole lot of mosquitos and other pests – do I need to say any more? For that reason alone I’ll take as many as I can get. We have a small pond/swamp kinda thing right next to the house. Last year, we only had the four Muscovies we started with and since we got them in late spring as babies they were relatively young through the summer. We had a whole lot of mosquitos here and the flies were bad too since we have goats and our neighbor keeps cows. This year, we have something like 33 Muscovies (I’ll tell you how we got from 4 to 33 in a minute) and we almost have no mosquitos at all. It’s absolutely amazing. The flies are not bad either. We still have some but nothing like before. I read somewhere that there was an experiment done where they put Muscovies in cow pans. The fly population was reduced by 80-90 percent! Isn’t that amazing? It also made me think that it would be great to keep Muscovy ducks in the bee yard. So many pests bother bees and the Muscovies do a great job of eliminating them. They scare snakes away – I have to admit that I am not entirely sure if I can give them the glory for this one because I also have another dog patrolling the farm this season and a couple of guineas, but we had no snakes here this year. Last year, I had snakes all over my chicken eggs. We had to physically remove six black snakes from the coop and we came across at least three more around the homestead. This year, we didn’t see one snake around here. Don’t quack – Muscovies are a quiet duck. They don’t quack. They won’t wake you early, they won’t come up to you screaming when you talk on the phone on the porch… They just waddle around and if they want to say something they hiss quietly. I love it! Calm and friendly – they are super calm ducks. The males can sometimes fight, but from my experience, they fight more with the roosters than with each other. And the males are so heavy that the fight doesn’t last long. To people, they are very friendly. They’ll walk up to you like a dog asking for food. They are slow moving so it’s not hard to catch them even if they free range. And they love to eat so they gather by the feed room at the same time morning and evening waiting for their meal. Other than the Muscovy males and the roosters having the occasional 30-second fight, they are very friendly to other animals too. I have them living with chickens, goats, guineas, dogs, and cats and they don’t have any problem with any of those. The only time the female is aggressive is when she is protecting her nest or her young. If I try to grab a duckling she might peck my hand. It’s not painful though. 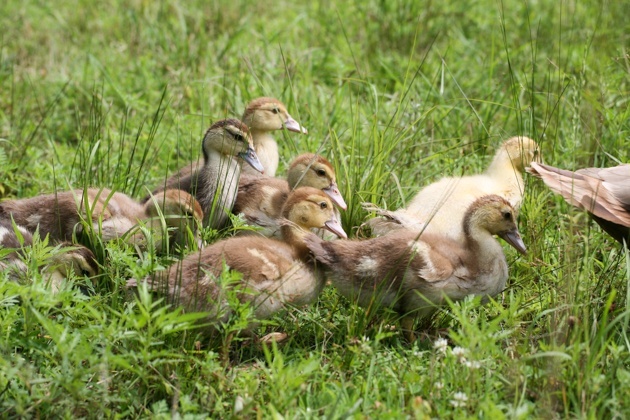 Hardy – Muscovy ducks can be raised anywhere, even if you live in a cold climate. They might benefit from a shelter during the winter, and you’ll have to use a heater to make sure their water doesn’t freeze, but other than that I don’t think they need any special treatment. Here in the South, I have no special shelter for them. They have access to the goat house but they will only use it to lay eggs. They do look for a cozy, closed off area to make their nest. I have a few plastic bins (you’ll see in the picture below) around the homestead and they will usually choose those bins as their nesting boxes or they’ll make a nest on a straw bale in the feed room. As far as shelter from the elements… They love standing in the rain! All the other animals will hide in their houses but you’ll find the Muscovies just standing still in the yard in the rain or snow. They don’t make a mess – all of my birds free range 24/7. My Muscovies don’t get on the porch and poop like the chickens do. In fact, they don’t get on the porch at all. They don’t try to sneak into the house. They don’t nest in my potted plants. They don’t scratch and dig. They don’t jump on the workbench and poop. They don’t fly into the dog pen. They don’t lay eggs all over the place but rather each female chooses a spot for her nest and use that spot to lay all her eggs before starting to sit on them. The only thing that I am not sure of is if they’ll ruin your garden or not. My garden is on the other side of the road so I never have them in my garden. From what I read, they might like greens (they eat grass a lot, like geese) and they might crash seedlings with their wide feet but for the most part, they are more interested in the pests. If anyone has more experience with Muscovies in the garden please comment below. **Update – they will enjoy eating your greens! Things like lettuce and kale and such. They won’t bother the larger plants (tomatoes, peppers, and such…) but you do need to be careful about your young plants because these ducks are heavy and will ruin anything they step on. Delicious eggs – Muscovy eggs are a bit larger than jumbo chicken eggs and they have a very hard and smooth shell that feels a bit waxy. They are great eggs for the little ones to collect because even if they drop them they most likely won’t break. The yolk is very large and rich and their eggs are very tasty. However, they are not an egg laying machine. They will lay around 180 eggs a year. They start early in the spring and will stop laying in the fall. They are the best mothers – this is another very good reason to keep Muscovy ducks. They truly are the best mothers. We’ll go over the whole life cycle a little later in this post, but for now, just know that they will hatch their own eggs and will take great care of their babies and when those babies are old enough they’ll lay more eggs and hatch more babies and so on. For someone who is trying to become self-sustained, this is invaluable. You don’t need to do a thing, just provide a good habitat and allow them to do their thing and you’ll have more and more ducks. From my experience, one female Muscovy can lay, sit, hatch, and take care of 3 or 4 nests between early spring to late fall. Each of those nests can have anywhere from 8 to 20 eggs in it… If you do the math, that’s a lot of ducklings! The meat is great – muscovies are very tasty. Their meat is pretty much the same as the dark meat of a chicken and some people say the breast is very similar to sirloin steak. Their meat is about 98% fat-free making it very healthy. I personally think that they are much easier to raise for meat than chickens. With chickens, you either buy the meat breed from a hatchery and raise them (8-12 weeks) or you raise your own dual purpose heritage breed. If you raise the heritage breed that can hatch their own eggs (to avoid being dependent on the store or the hatchery) you’ll probably have to wait around five or six months for the chickens to reach the right butchering size. You can read more about raising dual purpose chickens in my post: 10 Reasons to Raise Black Australorp Chickens. 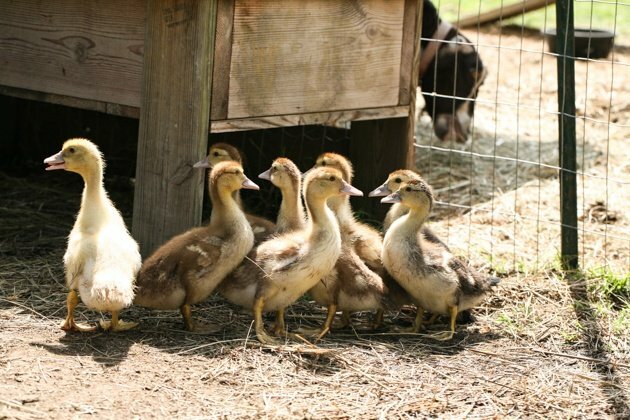 With muscovies, they’ll hatch their own eggs, raise their babies, and will be ready for butchering around 3 months of age. You can let them go a little longer if you want them a bit larger. You don’t need a store, you don’t need a brooder, you don’t need a heat lamp or electricity for anything else, and if your birds free-range you don’t even need to feed the babies. 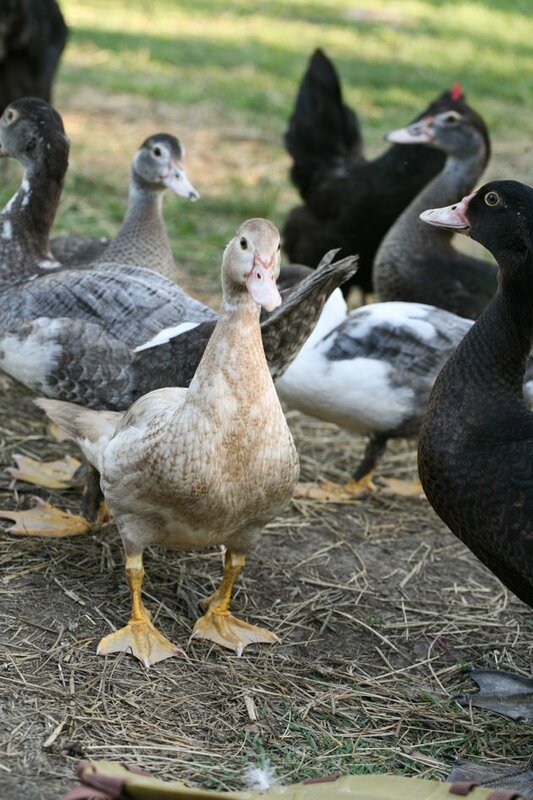 I think that’s a great deal for someone who wants to raise their own meat, so if you are considering raising meat ducks, Muscovies are a great option to consider. I show you step-by-step how to butcher a duck and process the meat in my post How to Butcher a Duck – A Step-By-Step Picture Tutorial. 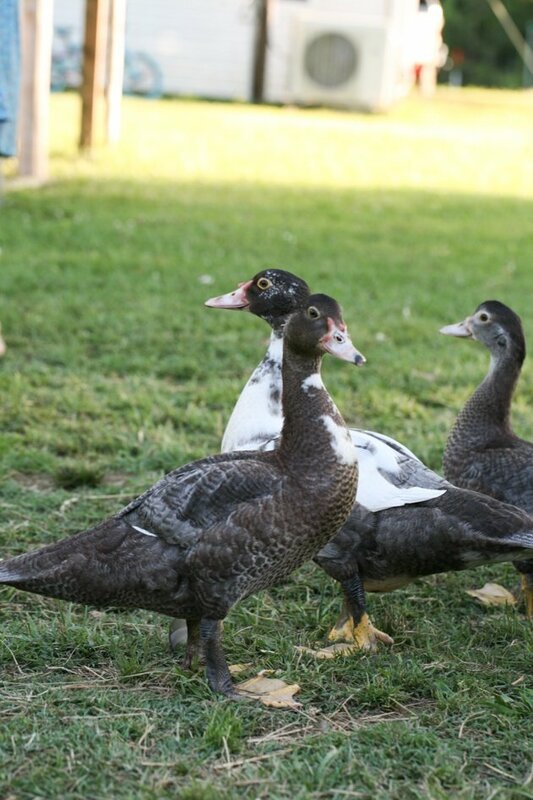 So if you are interested in raising Muscovies for meat (or any other duck), check out that post. 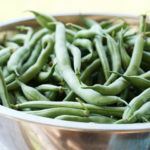 Water – I keep all the animals close to the house (read: How We Bought a $34,000 House in the Country) which sits on half an acre but there is nothing around us but fields and trees. On the side of the house, there is a small pond. It’s not my pond, it’s my neighbor’s but he can’t even see it from his house because of the trees and he doesn’t take care of it. It serves my animals very well and it saves me a ton of work because I don’t need to do any watering of any kind for my birds. Behind the house, there is a 30-acre field and on the side of it, there is another pond in the trees. This one is much nicer and deeper and cleaner but it’s further away from the house and it seems like the ducks prefer staying close. 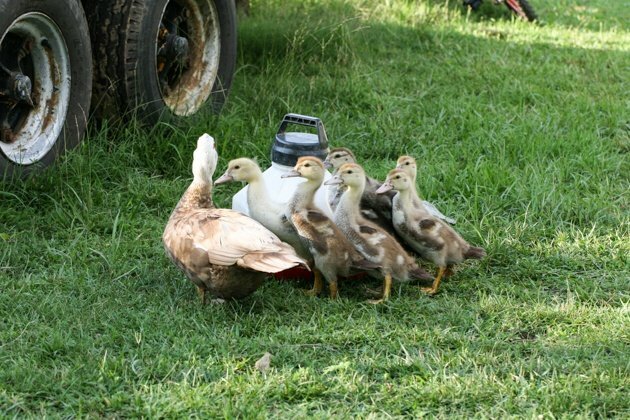 If you don’t have a pond, or if your ducks are in a fenced area (remember they can fly so you might need to clip their wings if you want them to stay) you will have to provide some water for them. They don’t need much, just a place to wash their head so a baby pool or a large shallow tab will do. Try to keep the water clean. This is a chore! You’ll probably have to change the water at least once a day. See how much work the pond saves me? What to feed Muscovy Ducks – I feed twice a day, morning and evening. I mix my own feed from wheat, whole corn, and oats but you can just use unmediated, palleted chicken feed. In the summer months, if they free range, they don’t need much food. They’ll eat grass and bugs. I still feed twice a day, just to keep them used to come to me and to keep them close for when I want to catch one to butcher, but I feed very little. They love the whole corn most of all. It seems like it’s a bit hard for them to pick up powdery food, the chunkier it is, the more they like it. 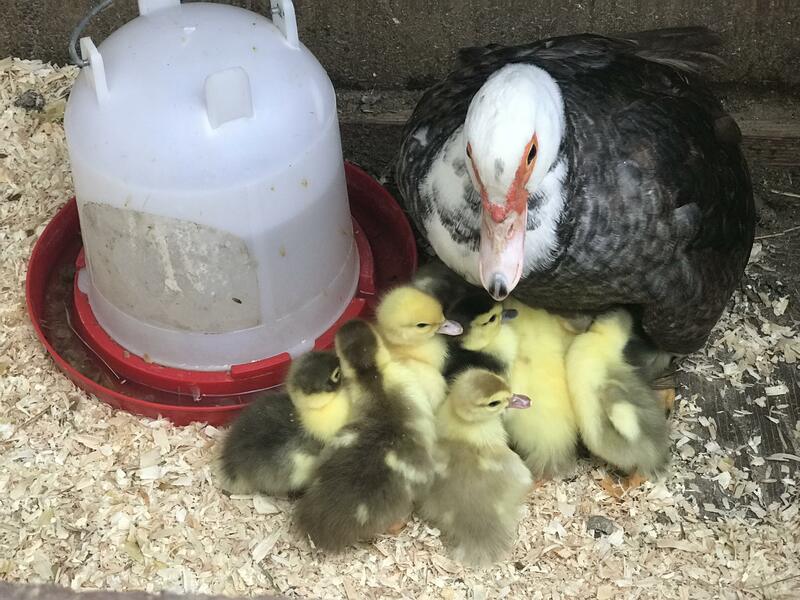 If you raise Muscovy ducklings in a brooder you would use chick feed for the first months or so, by then, they should be able to handle pelleted feed and cracked corn. Another couple of weeks and they’ll be able to handle whole corn. I’ve lost count, but I think I have somewhere around 70 birds between my ducks and chickens and guineas and I feed all of them 5 cups of feed in each meal during the summer. During the winter, when there is not much to forage, they will need more. Shelter – again, I don’t have any shelter for my ducks. They spend most of their time in the woods around the pond, walking around the yard, or sitting on the grass somewhere. We don’t have harsh weather conditions here in central NC so they don’t need to hide from strong winds or something like that. They don’t mind the rain… they are ducks, the wetter it is the more fun they have. When it’s too hot they hide in the woods or use the pond. The only time they use shelter is when they make their nests. I have nest boxes all around the place because the chickens lay eggs everywhere. So sometimes they’ll take over a nest box (if it’s on the ground) and sometimes they’ll just find themselves a corner somewhere. I read that Muscovies like to perch high on trees and make nests on trees but this is not my experience. I have never seen my Muscovies on a tree, never. And every time they make a nest it’s on the ground. I have one duck who likes the corner of the goat house. She flies over the goat fence and goes back to the same spot under the bench in the corner of the goat house time and time again to make her nest. I have another who took over one of the chicken’s nest boxes and will go back to that same box every time she starts laying eggs (the box is on the ground in the feed room). I have another who makes her nest under the milk stand. The nice thing is that even though they free range, they choose to make their nests close to me. I love it! They can go in the woods but they choose the homestead. I have no clue why maybe they just feel safe here. 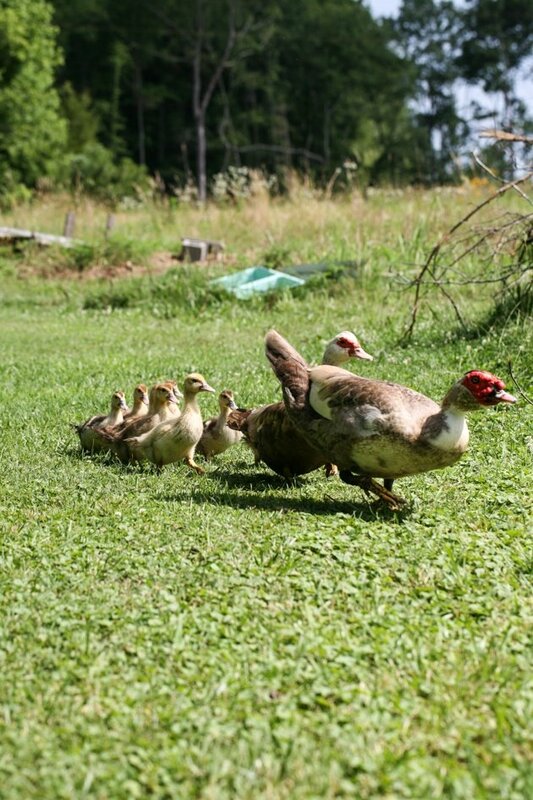 Safety – I will admit that when your ducks or chickens free-range you don’t have too much control over them. Makes sense, yes? I know approximately how many I have but if one disappears tomorrow I probably won’t realize it. It’s fine with me because I don’t feed them much, I don’t work hard on taking care of them, and it’s important to me that they’ll be free. I have more than enough to harvest for meat and I can collect the eggs if I want because they make their nests on the homestead. I do sometimes move the little ducklings and their mother to a brooder to keep the babies safe for the first two or three weeks of their lives. I’ll open the top of the brooder in the morning so mama can get out and go eat and swim, she will be back to the babies when she is done and spend most of the day with them. If I do this I have to provide food and water for the babies and clean the brooder when mama goes for her swim in the morning. After a couple of weeks, I’ll move them out of the brooder. I have an amazing dog! An Australian Shepherd mix that I picked up at the local shelter. She is free to roam around as well, And she protects the animals. Without her, I would have probably had no chickens or ducks left around here. We got our Muscovy ducklings in April of 2017 from friends. We paid $5 each. One male and three females. During the season, we lost one of the females. She wandered into the road and was hit by a car. If I remember correctly, they started mating and the ladies started laying eggs around September (around 7 months old). They were fully grown by then and already had the red around their eyes. They are not as quick as chickens when mating. It takes them some time so don’t worry if you see the male still on the female 15 minutes after you first spotted them. At some point when it got too cold they stopped laying eggs. During the winter, they were just hanging around the homestead, walking from here to there and flying around. In early March, they start to lay again. 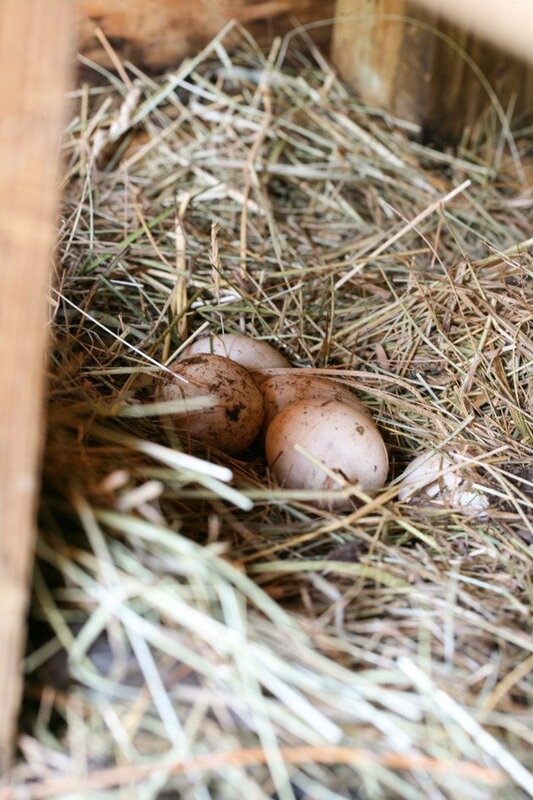 They choose a place (this one above is under the goat bench inside the goat house) and they start laying an egg a day. If you want to eat the eggs, you’ll collect them. I have more than enough chicken eggs so I decided to let them keep their eggs and hatch more ducklings which I’ll harvest for meat. I’ve noticed that they like the nest to have around 14 eggs or so on average. So for approximately two weeks, they will lay an egg a day and then start sitting on the nest. This duck that was building this nest ended up with 18 eggs in it (17 hatched). My other duck, who started building a nest right after the first one ended up with a nest of 13 eggs (all hatched and this is how we got to 33 ducks in a matter of a month!). During the couple of weeks that they build the nest, they don’t spend much time in it. They go, lay their egg and leave the nest. They cover the eggs and try to hide them at the beginning with the bedding but as the nest grows they start pulling their chest feathers and line the nest with them. This keeps the eggs very warm. 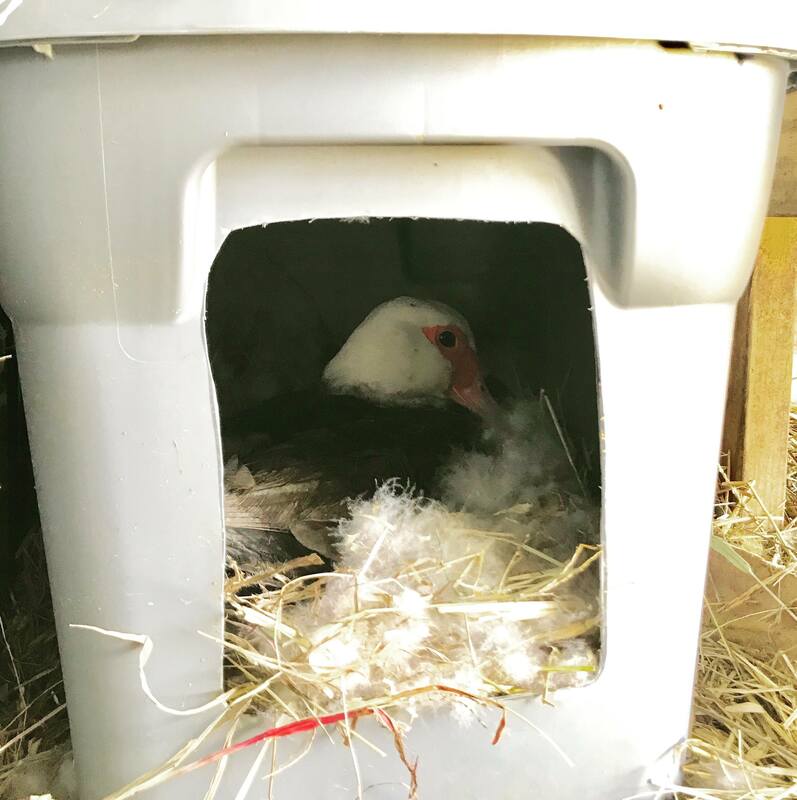 Once the nest is big enough, the female duck will start incubating her eggs (this girl took over one of the chickens nest boxes that I made from a plastic bin. It is on the ground by the milk stand in the feed room). You will notice once they go broody. They spend most of their time in the nest and they don’t allow anyone to get too close but they don’t go all crazy like chickens and starve for the whole time. They will get up for the morning and evening feeding, will go wash their head in the pond, get a drink and then go back to the nest. It takes them 35 days to hatch the eggs. You can watch a video of my first hatching on YouTube HERE. Once all the eggs hatch they will spend two more days in the nest with the babies. The mama will clean her babies and won’t leave them for a moment. She doesn’t show up for feeding those days and I don’t feed her or bring her water. I just let them be. After a couple of days, they will leave the nest and start walking around, staying together all the time. If a chicken or a dog is trying to get too close they find themselves in big big trouble! You don’t mess with mama duck. I’ve noticed that the animals understand this and just leave them alone. Here (if I don’t move them into a brooder), because I have the pond I don’t do any watering, but if you don’t have a pond I recommend providing a chicken waterer for them instead of a pool or a tub of water. The little ones need to drink and wash their heads but they can’t swim yet and they can drown. So for the first few weeks, until they get bigger all they need is a chicken waterer. I think it’s safer for them. Later, the mama will want to teach them how to swim so a little pool will do. On my homestead, I also don’t feed them anything special. Mama duck shows them how to forage. If they are fenced you can provide chick feed for them. They grow fast! Within a month to six weeks or so they are big enough and don’t need their mother anymore. I’ve noticed that she takes a break for a week or so and then starts mating again and building her next nest. Like I said above, a female Muscovy can hatch three, sometimes four batches of eggs during the season. Imagine each nest has 14 eggs in it… That’s a whole lot of meat that you didn’t do much to raise! 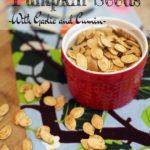 At around three or four months they are a good size to harvest. I’ll harvest the males first making sure to leave one male to every four females (I could never find the exact number for a male to female ratio with Muscovies, but 1:4 seems to work for me). I will also harvest some females this year because if I don’t I’ll be suffocated by Muscovies next year. You probably noticed from this post that I am completely in love with Muscovy ducks. And you are right! I can tell you with all honesty that I’ve never had another animal that was so productive yet so easy to care for. I know that it’s in part because of the settings that I have here, again, the pond saves me a lot of work and the fact that I don’t need to keep them contained in one area helps too, but still, I think they are fairly easy to care for even if they need to be fenced. I love the fact that they hatch their own eggs. I choose a heritage chicken breed that goes broody too for that reason. 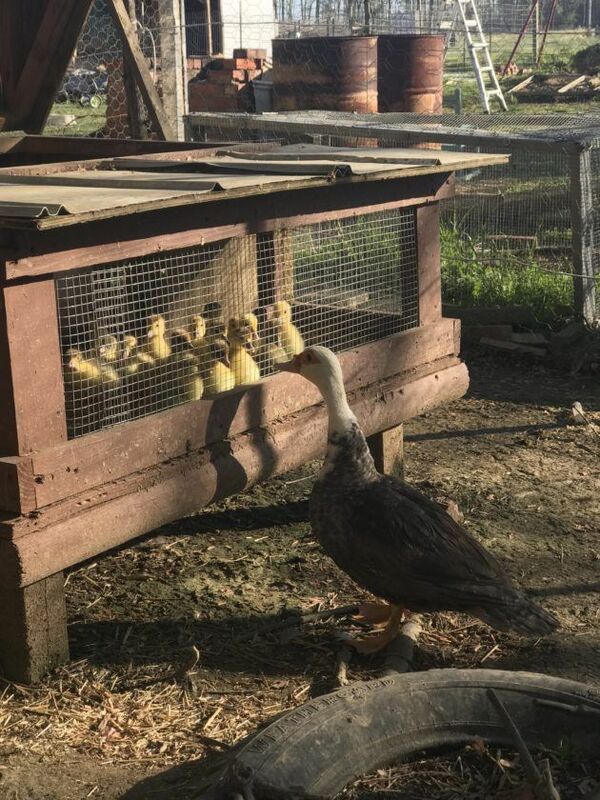 I don’t have to buy ducks (or chickens), I don’t need to find room for an incubator, I don’t depend on electricity, I don’t need to take care of a brooder full of pooping babies… It just makes so much sense to me to let nature do its thing and just be a part of it instead of micro-manipulating and managing it. If it makes sense to you too I hope you’ll choose Muscovies for your homestead! I have used Muscovy hens to hatch & raise Pekin duklings as well as chickens. They will hatch & raise most domestic fowls, best brooders bar none! I have replaced & mixed eggs under them with great success. I don’t have any other kind of ducks. I tried with my chicken eggs but the sitting time for duck eggs and chicken eggs is different. I didn’t really put too much effort into it because I choose to raise black australorp chickens which are just as amazing mothers as the Muscovies! They hatch their own eggs too and raise their babies. I choose my farm animal breeds very carefully, you are so right about them being the best mothers! It saves the farmer sooooo much work.